Pets can easily keep us entertained with their goofy personalities and adorable faces, keeping them entertained is another story. It is common to find yourself relaxing on the couch reading your favorite book, only to peek over at your pet and see them curled up on the floor with a bored look on their face. While dogs can be simple to entertain by simply walking them, cats are a different story. Most cats do not get excited when you reach for a leash, but if your cat does, just realize how special that feline is. While keeping your cat entertained is not as simple as keeping a pup entertained, it is easier than you think! Our pet experts at Royal Pets Market & Resort want to help you keep your cat entertained at all times! 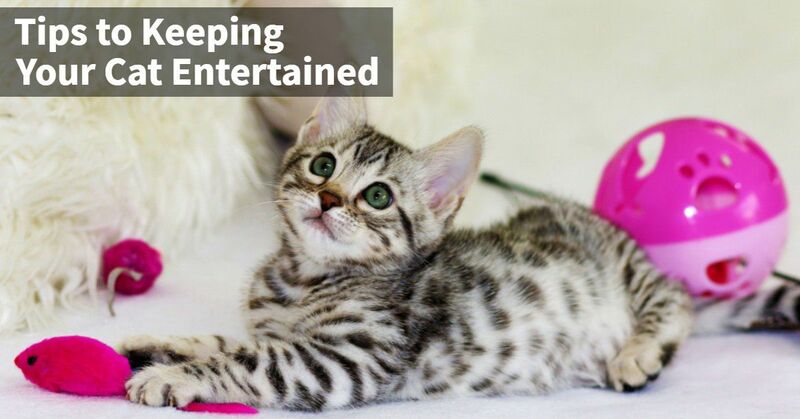 In this blog, we will give you tips on how to entertain your cat during dreadfully boring days. Be sure to stop by one of our four pet store locations to pick up a few new toys for your furry friend. Cat’s love to climb. To keep them entertained even when you are not home, buy them a cat tree. There are many different styles of cat trees that you can find, from small ones to extremely intricate trees. Find one that your cat will love and bring it home for them to enjoy, day after day. You can even hide treats on the different platforms of the cat tree to get your cat to explore it completely. This is a great thing to do before you head to work. Cats love windows and watching birds, squirrels, and people throughout the day. Putting the cat tree near a window allows your cat to sit and enjoy everything that is going on outside. As we already mentioned, cats love looking out the window and simply watching. Adding a bird feeder outside the window can give them endless hours of entertainment. Cats can often spend hours watching birds come and go from a bird feeder. While this may not seem like a fun and entertaining activity for your cat, you may find that your furry friend has little interest for other things when there are birds flying around outside. There are many different cat puzzles out there. Whether you want a food puzzle or a toy puzzle for your cat, you will be able to find many or even make your own! A food puzzle is great for cats that are food motivated. You can stick food or treats in the puzzle and allow your cat to work for the treats. This is not only a great way to keep your cat entertained, but it can also keep them fed without them eating their food too fast. If your cat isn’t food motivated, a puzzle toy is a great option as well. There are several different types of cat puzzle toys that can help keep your cat entertained. One of the most popular puzzle toys is a box with holes in it. You can stuff this box with their plush toys, balls, and other fun items. Your cat can spend hours trying to get the toys out of the box. This puzzle toy can draw out your cat’s natural instincts and make them feel as though they are hunting their toys! If you spend a good portion of the day at work and want to keep your cat entertained while you are gone, hiding treats is a great idea. Hide treats in their favorite places, like the window sill, the cat tree, their bed, and anywhere else they may go during the day. As they move around your home in the day, they will love finding treats in their favorite spots. You can also hide them in different spots so that they have to search for their treats, this is sure to keep them entertained. Cats love laser pointers almost as much as owners love watching their cats chasing the little red dot. This is a simple way to play with your cat and can be done at any time of the day. Get a laser pointer and simply let your cat chase it around your home. It may take a while to get them intrigued, but once they start it is hard for them to stop. Even after you end the game, you may notice your cat still trying to spot the dot somewhere on the walls. To get them interested in the laser, shine it around where they are until they notice it, slowly move the dot across the room and up a wall, low enough for your cat to still reach it, hold it there and wait. Eventually, your cat will not be able to continue sitting there, they will lunge for the dot and the game will begin. While you are playing with the laser pointer with your cat, be sure not to shine it in their eyes, this could harm them! There are many cat toys that most cats love. Some of them are balls with bells in them that they can push around on their own, others allow you to interact with your cat as well. Wand toys can be fun for your cat to play with and you get to jump in as well! Play with these wand toys and let your cat chase it around. This is a great way to interact with your cat and keep them entertained. It is true, cats love cardboard boxes and paper bags. If you leave these items around your floor, your cat will likely end up climbing in them, playing with them, and enjoy them more than anyone else ever will. Cats like boxes because they like to hide. Their instincts tell them to find confined areas, where they can hide and stalk prey. Giving your cat a box that they can hang out and stalk their “prey” during the day is sure to keep them entertained! If you have been a cat owner for a while and can handle adding a new feline to your family, getting your cat a friend can be a great way to keep them entertained. While cats may not play like dogs, they certainly will enjoy their time together. But before you head to the animal shelter, you will want to make sure a new cat is right for your family. If your current cat has never lived with another cat and is older than four, a new cat could be a bad decision. But if your cat is younger, getting another could be a fun way to keep your furry friend entertained. Hopefully, these tips for entertaining your cat has helped you better understand your cat and how to keep them happy all day long! If you need new toys for your cat, be sure to stop by our pet store today! We also offer vet, grooming, and boarding services. 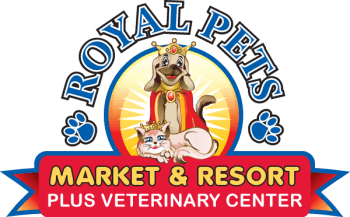 No matter what care or services you need for your cat, our team at Royal Pets can help! We have four locations in Apopka, St. Petersburg, Palm Harbor, and Carrollwood. Stop by today for new cat toys and keep your feline friend entertained!